Micromobility is all the rage these days. Here’s the latest report from my friends at 12 Tone Consulting… this one’s on e-scooters, the new big (little) thing in urban transport, coming soon (no doubt) to your town and mine. Get prepared for the onslaught with this excellent report! To prepare cities for e-scooters, 12 Tone Consulting created a “Regulation Breakdown” of U.S. cities and their recent scooter regulations. With this report, we provide unique takeaways from U.S. cities currently experimenting with (or proposing) pilot programs, which we then use to provide guidelines on how other cities should approach these new e-scooter vendors. Check out this new story on WalletHub.com… 2018’s Best & Worst Cities for Recreation. I contributed a few thoughts on what I think makes a good city for recreation, and how cities could go about achieving them. New data from the County Business Patterns shows a big loss in film jobs for Georgia since 2013. However, there has still been healthy growth overall since the state introduced up to 30% in transferable tax credits for film productions, with a 74% growth rate since 2010, and 29% overall since 2012. 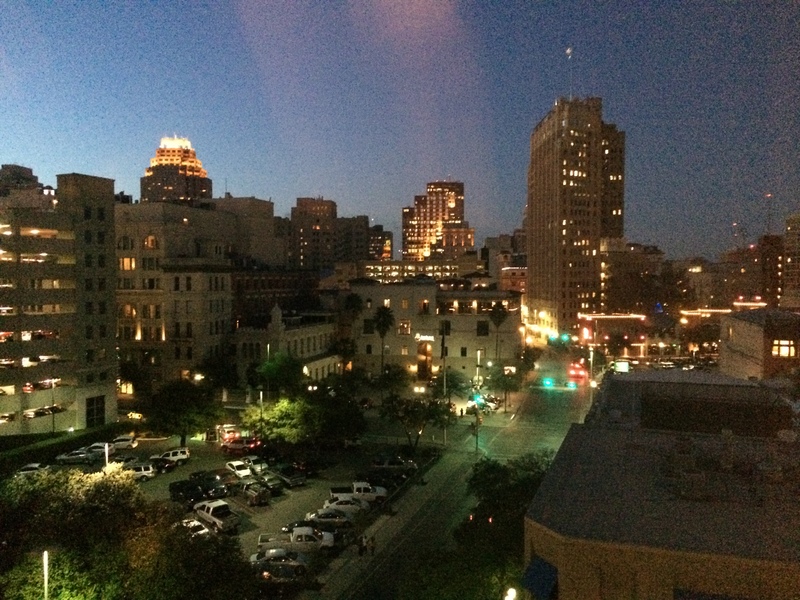 First, I traveled to San Antonio for my fourth Urban Affairs Conference. 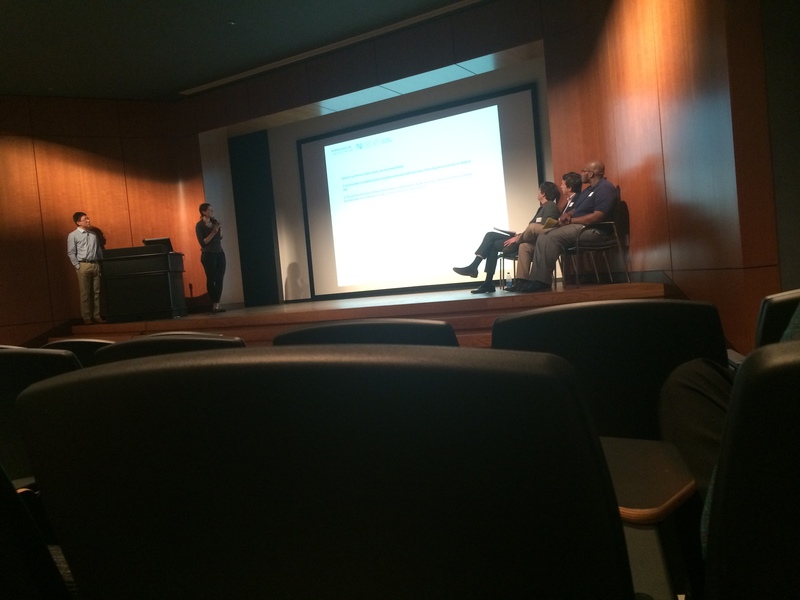 My presentation was a comparative study of 22 states offering movie production incentives (MPIs) over the last 10 years, with a special focus on the metropolitan nature of film employment. [see the complete presentation here]. Besides showing that across states, an increase in film industry employment has a lot more to do with the level of existing employment — showing a path-dependent relationship — than with the level of tax incentives available, I was able to show that film jobs are heavily concentrated in metropolitan places. 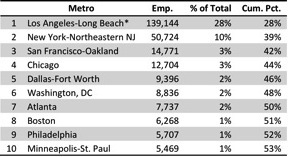 In a pooled sample from 2007-11, 94% of film industry workers lived in metro areas, with nearly half (43%) in the metros’ central cities. In addition, over half (53%) lived in the top 10 filmmaking cities, with nearly 40% of workers residing in the greater Los Angeles (*including Riverside-San Bernardino) and New York metros. In Georgia, nearly 90% of film industry jobs were in the 4 central counties of the Atlanta metro (Fulton, DeKalb, Cobb & Gwinnett). Anyone who has lived, worked, or even visited Atlanta lately can easily recognize the signs: a line of white trailers, covered windows with adjacent scaffolding and lighting rigs, and the occasional celebrity/zombie sighting… all evidence of the recent growth in film & TV production in Atlanta and the surrounding area. After giving a litany of recent productions shot in or near Atlanta in the last several months, including the Hunger Games series (all 4 films so far and counting); Anchorman 2, which had my beloved Manuel’s Tavern converted to a New York watering hole after replacing all the Atlanta sports memorabilia (and one naked portrait) with that of NYC teams; and of course The Walking Dead, whose popularity is such that after 4 seasons, it has spawned a cottage industry of TWD locations tours. According to Georgia’s Film, Music & Digital Entertainment Office, nearly $1 billion was spent directly in the state in fiscal year 2013, generating an estimated $3.3 billion in economic impact. That’s an increase of $55 million from FY2012, and nearly a quarter of a billion since FY 2011, when the industry spent $689 mil. That is nothing to sneeze at. But of course they didn’t mention the cost of the program, which could be up to 30% of that direct expenditure, or upwards of $300 million from state revenues, since the tax incentives are based on the production budget, not the taxes owed. Producers are allowed to sell their excess credits, often heavily discounted, to other companies and individuals who owe Georgia state income taxes, which has spurred a new industry for brokers of such tax credits. So given this growth in productions, what does that mean for the Georgia-based film industry? So far, it’s hard to tell. Based on the latest numbers I have (2011), film industry employment is at approximately the same level as it was in 2000, prior to the passage of a series of increasingly generous tax credits. There has been some growth since the bottom of 2004, following the passage of the first film tax credits in Louisiana, but the biggest spikes come immediately after increases in the credits, and then drop and/or level off (see the chart below). Occupational data looked a bit more promising, but while the four major film & television occupations showed growth overall, only the largest and least production-specific group — Audio & Video Equipment Technicians — showed actual growth. (see the following chart). In short, the last 2 years may in fact tell a different story, but in the mean time, I think we should be asking some tough questions about how this program is working, and whether it is really benefiting Georgia taxpayers, or even Georgia filmmakers.